The theme this month is a 'stair-step card' and the DT have done outstanding cards, you definitely need to head to Whiff of Joy's World of Ideas blog and have a look! This is my card, I created a centre stair-stepped card and used a WOJ digi image 'Lazy Afternoon'. 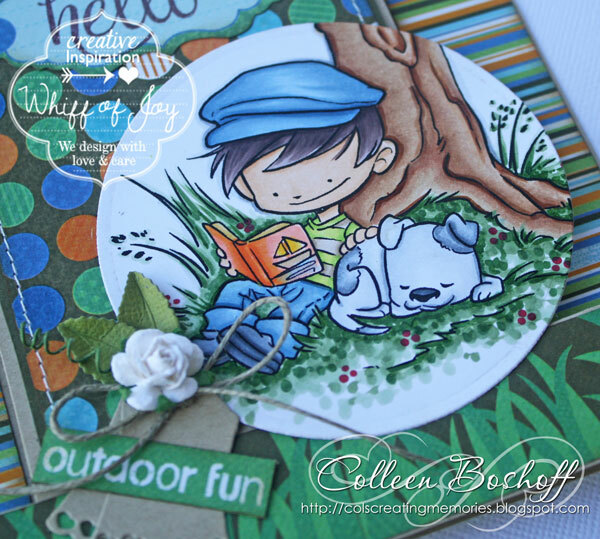 I used some older Kaisercraft paper in my stash and it is perfect for little boys cards! Finished it off with WOJ Sweet Tags with Hearts, WOJ button twine and a Wild Orchid rose.